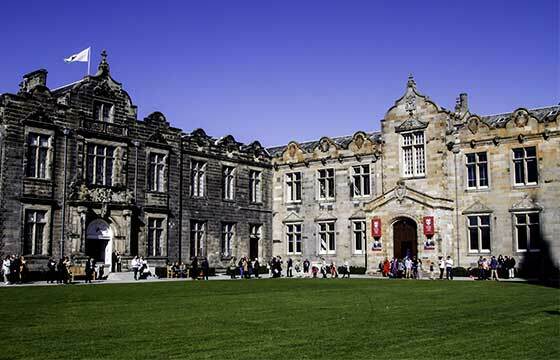 St Andrews is Scotland's first university and the third oldest in the English-speaking world, founded in 1413. Over six centuries it has established a reputation as one of Europe's leading and most distinctive centre for teaching and research. In the 19th century the University made considerable progress in developing teaching and research in the Arts, Divinity and the Biological and Physical Sciences. In the recent RAE the university achieved 5 rating in the top research schools. And also rated EXCELLECT top award in the TQA (Teaching Quality Assessment). The School of Management is delighted to have achieved International Quality Accreditation (IQA) from the Central and East European Management Development Association (CEEMAN). St. Andrew's one of Europe's leading universities finished fifth in the Sunday Times University. At set ready to celebrate University's 600th Anniversary celebrations will begin at the graduation ceremonies in June 2011 and continue through until St Andrew's Day 2013. Presently 7258 student are studying in the university out of which university is having UG Students 5952, PG students 1306. Popular courses Business, finance, Economics, MGMT, Philosophy, Psychology, Physics etc. Situated on the east coast of Scotland. On one side it has the rolling fields and north to east it looks out over a rocky headland to the dramatic waters of the North Sea. Town enjoys mild sunny summer days with rain, frosts and occasional snow in winter. St. Andrews has less rainfall but strong winds blowing in the North Sea. Just over 2 miles end to end population of 18, 000 including 7000 students. Accessibility of other general facilities like, bars, restaurant, hotels shops, theatre etc. University offer a wide range of accommodation.